An algal bloom on a Lake Erie beach located in Maumee Bay State Park, Ohio. This beach was one of the sites that the scientists studied for water-quality and environmental factors related to cyanobacterial harmful algal blooms. Photo Credit: Pamela Struffolino, University of Toledo. 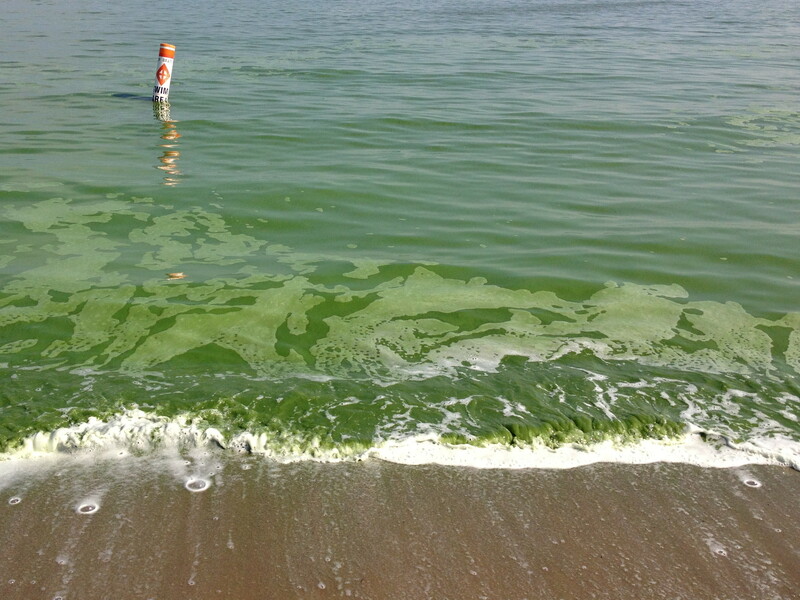 U.S. Geological Survey (USGS) scientists identified water-quality and environmental factors related to cyanobacterial harmful algal blooms at beaches in Ohio. This information was collected as part of a long-term plan to develop site-specific predictive models for microcystin concentrations. 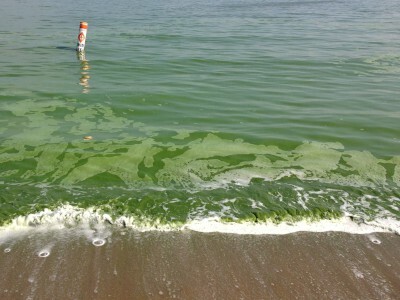 Harmful cyanobacterial "algal" blooms (cyanoHABs) and associated toxins, such as microcystin, are water quality issues for Lake Erie and inland lakes in Ohio. Prediction of algal toxin levels resulting from cyanoHABs in recreational waters is important to advise swimmers and boaters about potentially dangerous conditions. Although, models have been used successfully at Lake Erie beaches for predicting E. coli concentrations as part of the Ohio Nowcast, there are no nowcasts (estimates of current conditions) for predicting cyanoHAB toxin levels. Scientists identified the most relevant chemical and environmental factors that were related to microcystin concentrations. Water-quality and environmental factors were measured at seven recreational areas in Ohio during 2013‒2014. Water samples were collected weekly to monthly and analyzed for microcystin, nutrients, cyanobacterial genes, and phytoplankton community structure. models that that include sample collection and analyses along with real-time measurements (comprehensive models). Measurements of phycocyanin (a pigment produced by cyanobacteria), water clarity, pH of the water, streamflow from a nearby river, and lake level changes over 24 hours were among the factors for real-time models that best explained observed variations in microcystin concentrations. For comprehensive models, dissolved and total nitrogen or phosphorus, cyanobacterial genes (by molecular methods), and measures of the cyanobacterial community were among the best factors to estimate microcystin concentrations. 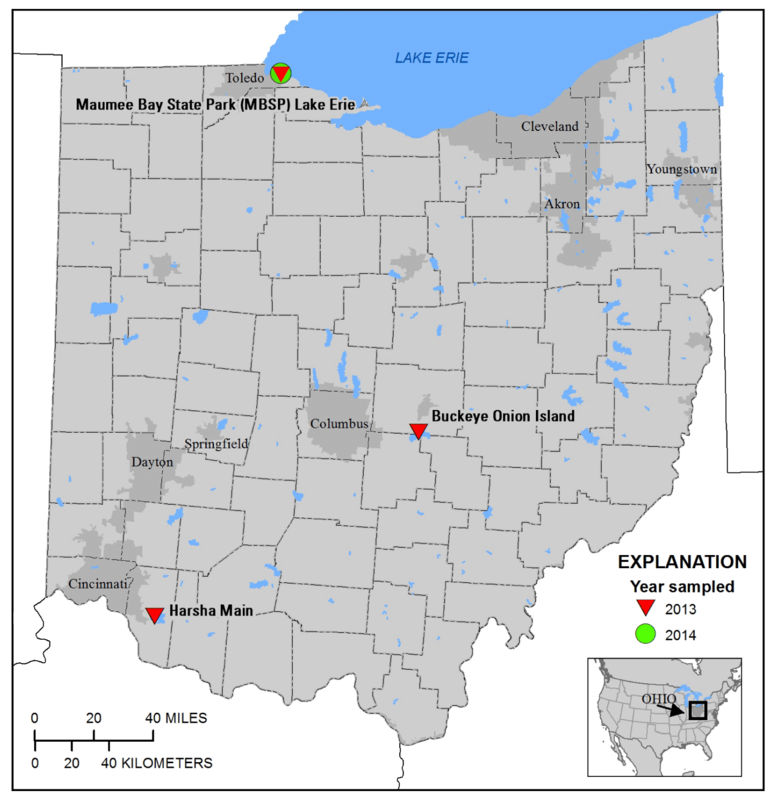 A map of Ohio showing the locations of recreational areas sampled in the 201314 study. Modified from figure 1, Francy and others, 2016. Predicting when and where a cyanoHAB may occur is important to protect the public that uses and consumes a water resource. The significant factors identified in this study and ongoing studies are part of a long-term strategy to understand the factors related to cyanoHABs. The information and models generated as part of this long-term approach can provide real-time warning of cyanoHAB events needed for management of recreational use and drinking water quality. The study was done in cooperation with the Ohio Water Development Authority, University of Toledo, Clermont County Soil and Water Conservation District, Erie County Health Department, Ohio Department of Natural Resources, Ohio Environmental Protection Agency, and the U.S. Environmental Protection Agency. Francy, D.S., Brady, A.M.G., Ecker, C.D., Graham, J.L., Stelzer E.A., Struffolino, P., Dwyer, D.F., and Loftin K.A., 2016, Estimating microcystin levels at recreational sites in western Lake Erie and Ohio: Harmful Algae, v. 58, p. 23-34. Francy, D.S., Graham, J.L., Stelzer, E.A., Ecker, C.D., Brady, A.M.G., Struffolino, Pamela, and Loftin, K.A., 2015, Water quality, cyanobacteria, and environmental factors and their relations to microcystin concentrations for use in predictive models at Ohio Lake Erie and inland lake recreational sites, 2013–14: U.S. Geological Survey Scientific Investigations Report 2015–5120, 58 p., 2 appendixes, doi:10.3133/sir20155120. National Plan for Algal Toxins and Harmful Algal Blooms—HARRNESS: Harmful Algal Research and Response National Environmental Science Strategy 2005–2015.